Shape, build, sculpt or smash. Crayola Modeling Clay is great for creating art or just playing with color. Because the clay always stays soft, you can enjoy the hands-on, tactile play again and again. Modeling clay is made of nondrying, nonhardening modeling materials with a soft consistency that helps children develop a sense of form and details. The clay also resists water thanks to its wax and oil-based formula, further lengthening its life span. 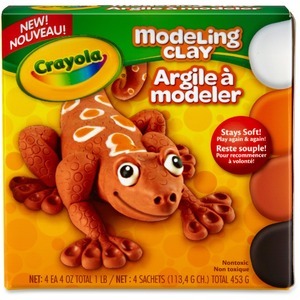 Nontoxic modeling clay comes in four individually wrapped colors and is recommended for children ages 6 and up. Colors include white, orange, black and brown. Modeling clay encourages children to create in a way no other art medium allows.